The continuing adventures of The Dresden Files are the stories I look most forward to reading these days. A lot of my favorite authors are no longer in a position to write new books and thus having an on-going series to enjoy is a gift indeed. And these books really stand out in my reading queue such that I now use them as "rewards" for having read other books of different franchises as part of my review efforts. White Night is another great addition to the series and yet another pun on Dresden being a knight of sorts. We've previously seen him drafted to work with the faerie courts in one way or another including performing the role of a knight. Here we have him in a different but perhaps more traditional role as he balances his individual investigation with the larger affairs of the White Council. I'm liking Dresden's new status quo, and that's a statement I keep on saying given the many shifts in his life across the various books. But it just reinforces how these stories aren't just episodic bits and instead are part of a larger continuing narrative for Chicago's wizard at large. 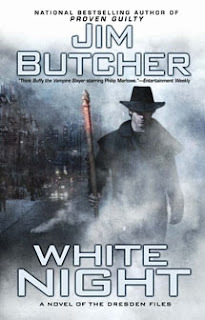 Synopsis: White Night is the ninth book in Jim Butcher's Dresden Files series of novels. The book takes place about a year after the events of the last book, Proven Guilty. As is often the case, the story begins with Muphy calling Harry Dresden to join her at a crime scene. But it turns out to be an apparent suicide, which should be an open and shut case for the police.But something feels wrong to Murphy and thus she reaches out to Dresden to see if he can't determine if there's more at work. Unfortunately, the suicide is in fact a well-disguised murder of a magical practitioner with clues only a Warden like Harry could detect. And it's not an isolated case and it's up to Harry to figure out what is going on. At the same time he's still juggling the training of Molly Carpenter, his young apprentice as of the end of the last book. Then there's the odd little mystery of his brother Thomas being missing in action for some time as if he were deliberately avoiding Harry. How all this comes together is the crux of how this book moves forward. What I Liked: Over the course of the series, Dresden's adventures have taken him well beyond Chicago and into far off realms. So it was nice to really ground this story in the city and with quite a mystery as well. It's easy to get lost in the magical side of things and the big adventures but Jim Butcher never loses site of the mystery that gets our Wizard detective out of the house to begin with. And this book was quite masterful in this regard given how the clues were laid out and the bigger mystery eventually came together. And the many manipulations that resulted in our big climax were pretty fascinating and with some far-reaching implications. And just when you think you have things figured out, there's even more to be discovered just around the corner and it all manages to make sense. And the book once again against with some pretty key shifts in the status quo and all these changes just get me more excited to read the next few books. What Could Have Been Better: While I know Molly couldn't be the focus of this book, but I do wish she had a bit more of a role. As Dresden's apprentice, I sort of hoped she'd be by his side more or at least often waiting at home with Bob or something. Instead we had her deliberately trying to sneak into Dresden's car and such in order to become part of the story. Their dynamic together is pretty fascinating at least, and all the more I wish we had more of that. Bringing in Elaine, Harry's first girlfriend, was an interesting twist but despite her relatively more prominent role in the story I was still left wishing we learned more about her. We had some reinforcement of prior statements about her being more skilled with more of magic's nuanced uses but not too much beyond that. Sure there was the flashback but it was more focused on Dresden's part in things. TL;DR: White Night is a thrilling book in the series with a great mystery and a seriously big confrontation at the end. I enjoyed reading it from start to finish and I'm eager for more. Thus the book gets a great 5 beads that Molly needs to move to prove her ability to focus out of a possible 5.